There's always one thing on my mind: what can I buy next to complete my wardrobe? As of recently it was a denim skirt, which I got from Urban. I'm constantly wondering what trends will stay (ex: distressed denim) and which will fade out (ex: velvet). To me, it is simply a waste knowing if I splurge on an item that I know won't be on trend for the next year. If I want to try out a crazy trend, I'll usually go to H&M, Zara, or Forever 21. I'm someone that is very picky on what I splurge on; it typically has to be something I could wear in 5+ years and still be fashionable, I must think of at least 3+ outfits that will work with the garment, and I need to be comfortable in it (aka no super tight jeans that I couldn't sit in). 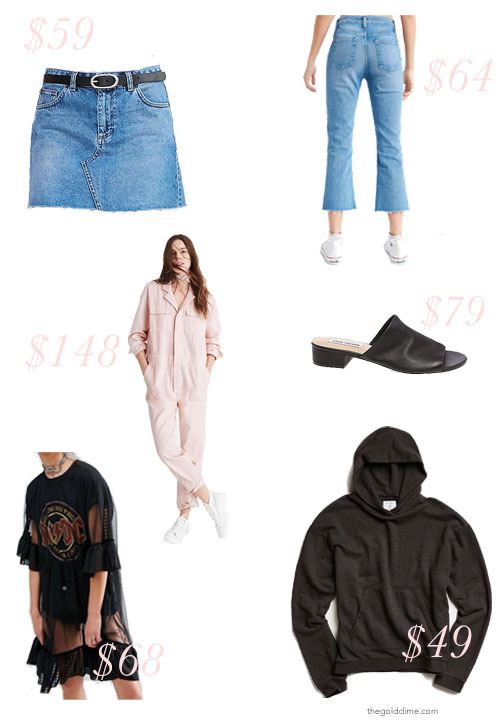 With all that being said, here's what I'm loving lately, things that are already in my closet but also things I'm thinking of acquiring over the next few months. I got this hoodie a few weeks ago, and I kid you not, I have worn it at least once a day since. I love the simplicity, it's comfy, and the perfect amount of oversized. I got men's, simply because they're cheaper than women's, and I don't like when they're super tight at the waist. I typically wear this with a turtleneck underneath with jeans and sneakers. Hoodies are huge right now, specifically bright plain colors like the Champion ones, and those with cool graphics. It's really not a shock that cropped denim is sticking around. It's so versatile to style, and is flattering for everyone. I personally love wearing metallic socks and sneakers with them, but I've also worn tights under them with kitten heels. It's just a fun way to show off your footwear. There are tons of mule styles, but I'm loving the look of short, minimal heels (kitten heels too). I think these will be so simple to slide on with just about everything this spring + summer. I plan to wear them with the cropped denim or a jean skirt, a graphic tee, and statement sunglasses. I practically live in cutoff denim shorts in the spring and summer, so I really wanted to get a jean skirt this year to switch it up. (I suggest sizing up in this one!) It dresses up a simple plain tee, and has more appeal than shorts. I'm not positive if I'll ever purchase a jumpsuit, but I absolutely love them (I'm usually too short for any of them, but I think I might try this one!). I mean it's an outfit you don't even have to put together, who wouldn't love that? Sheer and mesh shirts have been trendy for a while now, but I really love the skirts and dresses I've been seeing. The one I picked lets you pick a simple outfit underneath, and adds a really intricate element to the look. I think this form of mesh is much more modest, but still lets you show some skin. 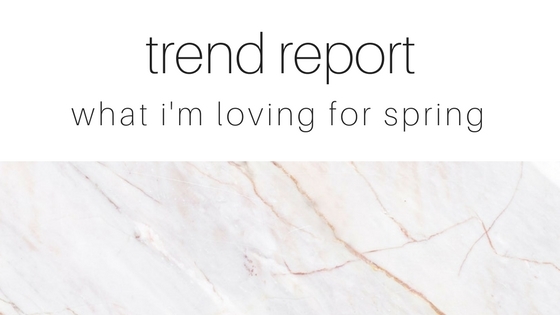 What are you purchasing for Spring? Loved that cropped denim!! So funny how so many of these trends were in style decades ago!